I had my color palette created back in March 2006 specifically with my business in mind. I had no idea it would affect my life in such a transformational way. Along with the palette I received my soul essence imprint which is illuminated by twilight. The energetic blueprint that goes along with this now informs everything in my perfume line. For example, my style motif includes Antique and Vintage inspired items as well as those that are Artistic Creative. These two styles are weaved into all aspects of my branding. It's amazing how deep into the rabbit hole one can go with this. I suppose as a visual artist with Venus in Libra, a Pisces Moon, and lots of Virgo planets the obsession for beauty can get a little overboard. 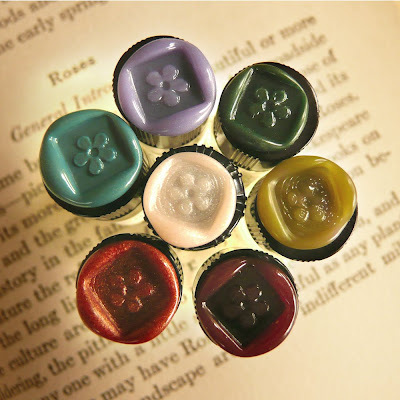 Today I took a photo of some of my sample vials with the color coded wax seals on the caps. I have already integrated this color coding system to the photos of the perfume flacons with their crochet bags as well as the solid minis. Finding the right kind of wax in the right color hue has been a bit of a dilema...sigh. 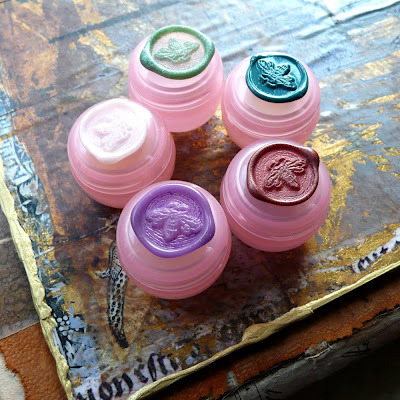 For example the wax seal that I began using for the Chaparral® Solid isn't my favorite, the "bling" factor is a little over the top with the gold glittery quality. I'm now experimenting with a different sage type color, but, it's also not quite it. This particular wax also isn't adhering to the top as well as some of the others. I'm also still on the hunt for the right wax hue for Rosa. Finding the right color thread for the pouches has had challenges as well. It's all a bit of an adventure, the ability to bend like a reed and be flexible has been crucial. Martha has been an incredible asset and great to bounce ideas with. Her experience in the fashion world is a real benefit. In the morrow we are off to hunt for beads and other cool adornments.